Within the tightly knit Cherokee community in the Smoky Mountains, a secret society of Snake Dancers is led by a group of elders, four of whom guard an artifact of incredible power. Guardianship has been passed from father to son for over 300 years. Theses artifacts belonged to Kanegwa’ti, a medicine man who controlled the power of Uktena (an evil spirit) in order to protect the tribe. Even the four guardians cannot reveal what they guard. The tradition of secrecy was set up by Kanegwa’ti to prevent anyone from awakening Uktena and bringing destruction. Grady Smoker, one of the Snake Dancers, has spent decades tracking the other guardians in order to pinpoint the location of each artifact. In a misplaced effort to regain power for the tribe, he unwittingly becomes the vessel for Uktena. Johnny, an outsider like Kanegwa’ti, has been under the watchful eye of the elders since he was a boy. 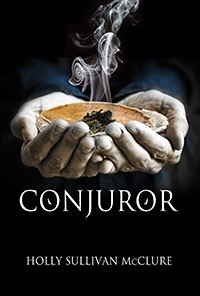 Walker Copperhead is convinced Johnny is the long awaited Suye’ta, the next conjuror. While Johnny is committed to the Cherokee way of life, he isn’t buying into his new role. It isn’t until he comes face to face with Uktena that he realizes all the Cherokee myths are true.